Is it too hot to play golf? In a word, Yes! At least for me, when the thermometer goes above 90 degrees coupled with humidity above 60%, I just cannot enjoy a round of golf. Let alone justify the cost of the round knowing I’m just going to suffer for 4 or more hours. Two weeks ago I had two days off, a luxury that has been hard to come by as of late. However, since the heat index was over 95 degrees each day, I elected to remain inside in the air conditioning. This past Monday it was just as hot but it had been over four weeks since I had touched a club, let alone played a round. Needless to say, the “itch” got the better of me and I decided to brave the heat and play a round of 18. The high was 93, but I had two things going for me, first, it was mostly cloudy, and secondly, I had the Frogg Togg Chilly Pad. I admit that I was looking for an excuse to test out my new Chilly Pad. I can say without any hesitation, this product was a life saver! It is similar to a “Sham-wow” in the way it absorbs and holds water, but it has a textured side that is the “cool side” and it really is significantly cooler than the air temperature. 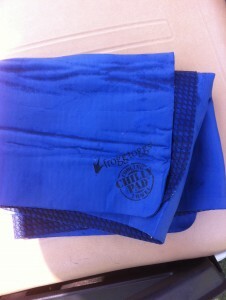 I wrapped it around my neck or draped it over my head and really helped regulate my core temperature. 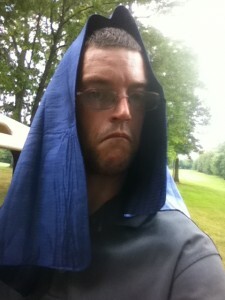 The heat began to effect my body and subsequently my game on the back nine. 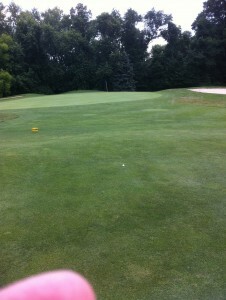 It came upon me slowly, I began to miss some approach shots, loose my focus on the greens. My usual 1 or 2 putts turned into 3, 4, or 5 putts! I knew I needed to find shade and take a break. After letting a few groups play past me, I went back at it. Alas it was too late, I made it through the par three 17th scoring a abysmal 5 on the hole. And as I began to walk off the 17th green back to my cart, my legs literally stopped working! I just totally locked up. Part of that is related to my Cerebral Palsy (spasticity that is associated with CP), but in this particular case it was severe dehydration causing the phenomena. I could not walk! I had to skip 18 and just drive the cart strait to my car. As much as I love this game, I think i have to resign myself to the fact that I just cannot handle these extreme conditions. More importantly, realize there in no shame in staying home in a cool air conditioned house, mall, or movie theater. That does not only apply to me either, anyone, at any age or ability can be beat by the heat. Be careful and be smart out there fans! I too suffer from heat exhaustion and actually had to quit on a round at Barefoot (Norman) in Myrtle Beach last year while on vacation. Not good. I’ve subsequently found that a key to sustaining yourself in hot weather is to hydrate before you go outside. Essentially start drinking water an hour or two before play and you’ll feel much better all the way around. Of course your moist towel and plenty of water/sports drinks during play are important, but the true key is to load up before you play. -Good luck! Agreed, and I have actually began hydrateing the entire day prior to playing a round in such heat. It does make a huge difference!